One Eternal Day: FDR and Paul Ryan? When Roosevelt proposed Social Security in 1935, he envisioned a contributory pension plan. Workers' payroll taxes ("contributions") would be saved and used to pay their retirement benefits. Initially, before workers had time to pay into the system, there would be temporary subsidies. But Roosevelt rejected Social Security as a "pay-as-you-go" system that channeled the taxes of today's workers to pay today's retirees. That, he believed, would saddle future generations with huge debts — or higher taxes — as the number of retirees expanded. 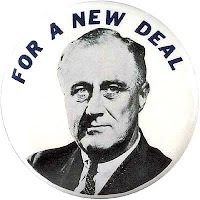 Discovering that the original draft proposal wasn't a contributory pension, Roosevelt ordered it rewritten and complained to Frances Perkins, his labor secretary: "This is the same old dole under another name. It is almost dishonest to build up an accumulated deficit for the Congress ... to meet." "We put those payroll contributions there so as to give the contributors a legal, moral and political right to collect their pensions. ... No damn politician can ever scrap my Social Security program."